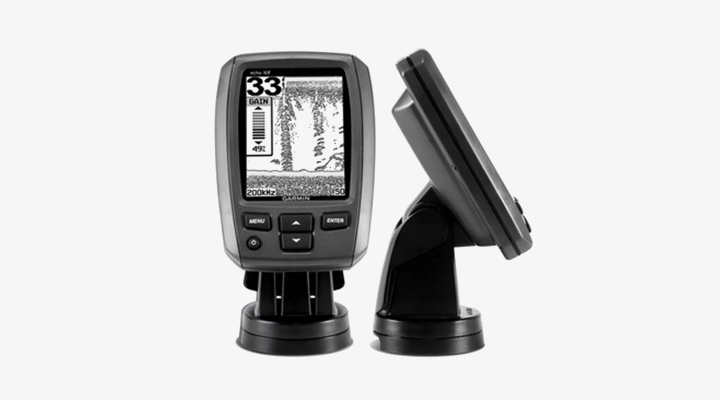 This state-of-the-art fishfinder features the best sonar technology at a very reasonable price. It also features the small, lightweight, and portable design that makes it easy to carry on any fishing trip. Furthermore, the Garmin Echo 101 is extremely user-friendly, and even the newest beginners to using fish finders are able to easily navigate this model. This is actually the smallest and cheapest version of a fish finder that Garmin makes. It is competitively priced compared to other models of the same size and strength. It’s effective, especially given its price! The screen on this device is clear and efficient; it presents the information in a sharp and easy to read way. This adds to the user-friendliness of the device as a whole, and makes the fish finder even easier to use, especially for people who are using a fish finder for the first time. Furthermore, the screen of this device features HD-ID technology, which allows you to more easily discern what is a fish and what is just miscellaneous underwater stuff. However, one of the biggest drawbacks of this model compared to other models is its simple greyscale display. 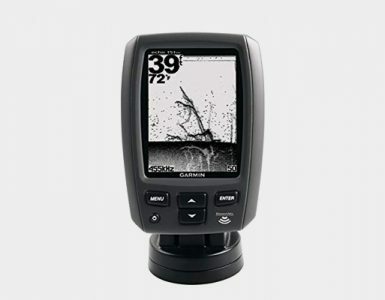 While other models can provide you with a color-coded display that makes the fish literally impossible to miss, this fish finder has only a black and white version of the display. Some people have had some trouble with the greyscale display. One of the best qualities of this fish finder is its single sonar, which can reach depths of up to 1,500 feet and give a crystal clear image of where the fish are. The sonar on this model, which uses a single beam, has a peak to peak power of 1,600 watts, which means that the picture that the fish finder produces is clear and easy to read, even for beginners. Even though the single beam sonar is effective enough, it is not as effective as a fish finder equipped with dual beam sonar. 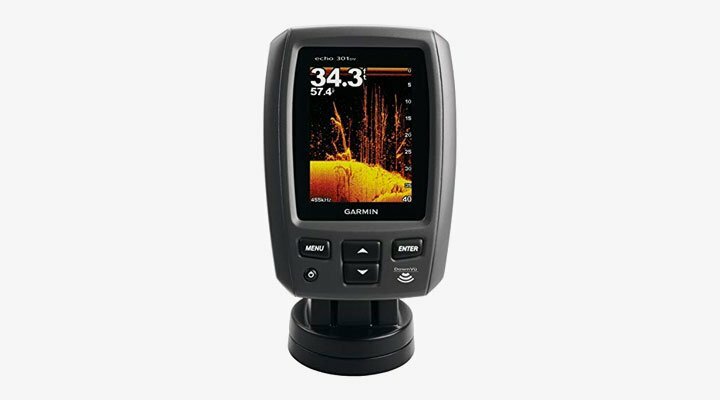 This Garmin fish finder is really excellent at giving accurate reads for the depth of the water where the fish are sure to be biting. It really boosts your ability to catch more fish at a more effective rate. The screen of this device features HD-ID technology. The sonar is powerful enough to give very clear and accurate readings. The device’s design is small, sleek, and easy to transport. 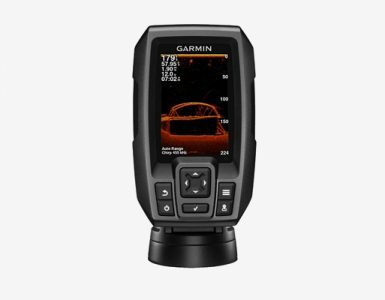 This is one of the best value models on the fish finder market. This fish finder has a decent battery life. The device features a greyscale, not full color, display. This fish finder has one a single beam, not double beam, sonar. This device doesn’t have more advanced features such as GPS or chart plotting capabilities. Some users have reported minor issues with the mounting equipment, which holds the fish finder in place on your boat. While this doesn’t interfere with the performance of the fish finder, it can cause your device to fall into the water and be rendered worthless. Also, the refurbished versions of this model have turned out to be less than stellar, with many users reporting problems with the screen pixelating after being refurbished. Make sure that when you buy this product, you’re buying a real, new, original version, and not a knock-off brand. It is worth it to stick to the recognized Garmin brand! Most users were overwhelmingly pleased with their experiences using this fish finder. Since it reads so accurately, especially for the depth of the fish, many users reported catching more fish than ever before while they were using this device. Most users have been extremely pleased with this product, especially since it is priced so affordably. Some have had problems with the battery life, but this is to be expected with any portable electronic device. Some users have used it as a secondary unit with another fish finder, and they report that it boosts the results and reliability of their fish finding to use this model as a secondary unit. For whatever reason, this is a great fish finder, especially for its great price!